Every year on December 1, people from around the world spend the day learning about AIDS and encouraging the millions of people suffering from it. I am a member of The Chapel in Akron, where I lead an incarnational community. 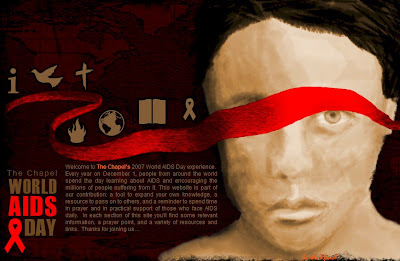 My friend Joel Daniel Harris, on staff at The Chapel (and on Associate Staff with the CCO) has designed an incredible interactive website, ChapelAIDS.org. It is a "tool to expand your own knowledge, a resource to pass on to others, and a reminder to spend time in prayer and in practical support of those who face AIDS daily." In each section of this site you'll find some relevant information, images that provide the personal context, a prayer point, and a variety of resources and links. I HIGHLY recommend you check it out. It really is an excellent way to prepare for this Saturday. YIKES! Do I really write so pompously? This has been going around the blogs - Sivin Kit had it, and then Scot McKnight, which was followed by Michael Kruse. You type in your URL and it tells you what reading level your blog is. I've been a life-long Cleveland Browns fan. And the last time the Browns won a title was the year I was born (1964). It is very difficult being a Browns fan. It seems that there is some divine reason the Browns are not allowed to win big games. It seems that the ball always bounces the other way. But this time. Oh, this time. Against the hated Ravens (the former Browns! ), Phil Dawson's 51-yard field goal to send the game into overtime bounced off the upright, caromed off the curved pole that holds up the field goal post, and inextricably flew backwards and landed in the end zone. The officials under the filed goal looked at each other inquisitively, and Field Judge Jim Saracino signaled that it was no good. But Back Judge Keith Ferguson said that he thought he saw it hit the post behind the cross bar and insisted on this to Referee Pete Morelli. Meanwhile, I'm at home yelling at the TV that the field goal was good. "It hit the post behind the cross bar!! It's gooooood!!" And after watching the replays, there was no doubt. Good. 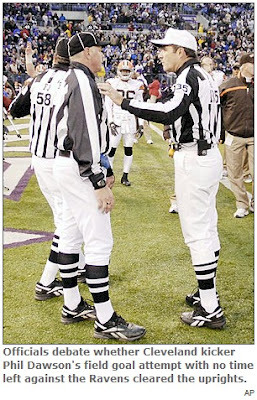 And, even though field goals are not reviewable with replay, the Referee proclaimed that it was indeed good. This time, the ball bounced the Browns way. WASHINGTON (Associated Press) — Televangelist Pat Robertson, founder of the Christian Coalition, endorsed Republican presidential candidate Rudy Giuliani on Wednesday. While Robertson has been heavily courted by a number of presidential candidates -- most notably Mitt Romney -- in recent months, he decided to cast his lot with Giuliani in order to counter a movement among some evangelicals to support a third party candidate if the former New York City Mayor becomes the Republican nominee. "I thought it was important for me to make it clear that Rudy Giuliani is more than acceptable to people of faith," said Robertson. "Given the fractured nature of the process, I thought it was time to solidify around one candidate." He insisted that while some on the "fringe" of the social conservative movement may see Giuliani as an unacceptable nominee, the "core know better." Robertson said although he and Giuliani disagree on social issues, those disagreements "pale into insignificance" when measured against the import of the fight against global terrorism and radical Islam. "We need a man who sees clearly how to deal with that issue," said Robertson. The latest Wall Street Journal/NBC poll showed that white voters who identified themselves as evangelicals are divided evenly among Mr. Giuliani, Sen. John McCain of Arizona and former Sen. Fred Thompson of Tennessee. Former Arkansas Gov. Mike Huckabee came in fourth. Recent endorsements underscore the divide. On Tuesday, conservative activist Paul Weyrich, another influential religious-right leader, said he backed former Massachusetts Gov. Mitt Romney for the Republican nomination. But Mr. Weyrich made it clear his motivation is to keep the nomination from going to Mr. Giuliani. Mr. Romney faces opposition from some Christian conservatives wary of his Mormon faith. But that didn't stop Bob Jones III, head of the evangelical Bob Jones University in South Carolina, from endorsing Mr. Romney in October. …Other influential conservative leaders, including James Dobson, head of Focus on the Family, have declined to pick a candidate but he has made it clear he opposes a Giuliani nomination. In an online column in May, Mr. Dobson said backing an abortion-rights supporter like Mr. Giuliani would violate "my conscience and my moral convictions." His moderate stances on immigration and a cash-strapped campaign have worked against Mr. Huckabee -- a Baptist minister with a record against gay marriage and abortion -- with conservative activists. Questions about electability might explain why Mr. Thompson, who is positioning himself as the only true conservative candidate with a 100% voting record against abortion, has yet to receive a significant endorsement from the evangelical community. I find it interesting (and quite disturbing) that it was on Pat Robertson’s TV show "The 700 Club," two days after 9/11, that Jerry Falwell blamed the attack on "the pagans, and the abortionists, and the feminists, and the gays and the lesbians," and Pat Robertson said, "Well, I totally concur." The current Republican front-runner in national polls, Rudolph W. Giuliani, could hardly be less like their kind of guy: twice divorced, thrice married, estranged from his children and church and a supporter of legalized abortion and gay rights. Alarmed at the continued strength of his candidacy, (Focus on the Family’s James) Dobson and a group of about 50 evangelical Christian leaders agreed last month to back a third party if Giuliani becomes the Republican nominee. But polls show that Giuliani is the most popular candidate among white evangelical voters. He has the support, so far, of a plurality if not a majority of conservative Christians. If Giuliani captures the nomination despite the threat of an evangelical revolt, it will be a long time before Republican strategists pay attention to the demands of conservative Christian leaders again. And if the Democrats capitalize on the current demoralization to capture a larger share of evangelical votes, the credibility damage could be just as severe. It certainly is an interesting time in politics for us evangelicals. What do you think? Charity Navigator is "America's premier independent charity evaluator" and "works to advance a more efficient and responsive philanthropic marketplace by evaluating the financial health of America's largest charities." Founded in 2001, Charity Navigator has become the nation's largest and most-utilized evaluator of charities. They offer an unbiased, objective, numbers-based rating system to assess the financial health of over 5,000 of America's best-known charities. 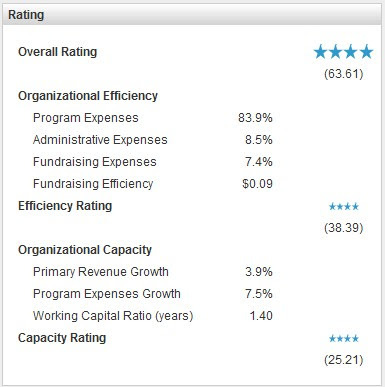 Charity Navigator's rating system examines two broad areas of a charity's financial health -- how responsibly it functions day to day as well as how well positioned it is to sustain its programs over time. Each charity is then awarded an overall rating, ranging from zero to four stars. As most of you know, I am an Area Director for the CCO, a campus ministry that partners with churches, colleges and other organizations to develop men and women who live out their Christian faith in every area of life. The CCO has been awarded a FOUR-STAR rating. I've been "tagged" by Scott Berkhimer at his excellent blog, Theopraxis. He was tagged by the best Christian economist that blogs, Michael Kruse, who was tagged by David Ker of Lingamish. The "meme" is meant to discover "five little-known treasures of the blogosphere" in order to put to death our blog boredom. Follow the above links to discover these bloggers' suggestions. Joe Troyer - What is the Kingdom? For those of you I listed, consider yourself tagged if you wish to join in. Let us know what five blogs you think are worthy of more people checking out!